I have found that a number of people have been experiencing difficulty in distinguishing between females of Euophrys herbigrada (Simon) and E. frontalis (Walckenaer). This is partly because the illustrations of the epigynes in Roberts (1985, fig. 50c,d) show typical examples of each species, but do not take account of the extent of variation. The epigyne of herbigrada seems to vary comparatively little, and Roberts's figure 50d is an accurate representation. The epigyne of frontalis, however, varies considerably, and I have seen some specimens in which it is indistinguishable from that of herbigrada. After examining a large number of specimens, I have come to the conclusion that there is only one totally reliable, unambiguous, diagnostic character which distinguishes females of these two species: the presence in herbigrada of a dense band of white squamose hairs on the clypeus, below the eyes, as shown in Figure 1. These hairs are similar in general form to the brushes of white hairs on the male palp of frontalis, but shorter. The presence of white hairs on the clypeus is mentioned in the description of E. molesta O.P.-Cambridge (=herbigrada) in Locket & Millidge (1951, p. 223), but it is not emphasised as a diagnostic character. It is, however, given as a key character separating females of the two species in Simon (1937) and in Heimer & Nentwig (1991). 1. The dorsal surface of the thorax is dark brown in herbigrada, whereas in frontalis it is usually paler even in otherwise dark specimens. 2. The abdomen of herbigrada nearly always has two or three clearly defined dark longitudinal stripes ventrally, but these are also occasionally present in very dark specimens of frontalis. 3. The general impression of the dorsal surface of the abdomen of herbigrada is of a dirty brown spider with scattered pale blotches, while frontalis usually appears as a pale yellowish spider with a sharply defined pattern of black markings. However, very dark specimens of frontalis are occasionally found which approach the coloration of herbigrada. The identification of males presents no problems, as herbigrada is instantly recognisable by the absence of the conspicuous tufts of white hairs on the palps found in frontalis. Males of herbigrada do, however, possess white squamose hairs on the clypeus, but they are arranged in two distinct groups: a narrow band of short recumbent hairs just below the eyes, and a fringe of longer ones along the ventral margin of the clypeus. These are absent in frontalis. Bristowe (1958) indicated that the white hairs on the male palps of frontalis are used in signalling to the female during courtship, and are thus probably important for species recognition. As the male of herbigrada lacks these hairs, but possesses white clypeal hairs instead, these may fulfil a similar function. 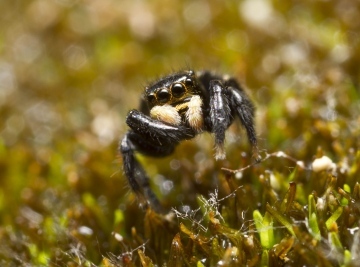 In salticids, which have a strongly visual courtship and colour vision, structures and colours at the anterior end of the spider are likely to play a more important part in species recognition (and hence be of greater taxonomic value) than characters which are invisible to prospective mates. The main centre of distribution of E. herbigrada is around the western Mediterranean, but it also extends up the west coast of France as far as southern Brittany, and it has been recorded from Jersey. In England it has only been found on dry, sunny slopes or cliff-tops within a few hundred metres of the sea, between Kynance Cove (Cornwall) and Lulworth (Dorset). It is apparently fairly common in some places around the Lizard peninsula and along the coast of south Devon. Its distribution suggests that it is sensitive to frost. It therefore seems unlikely that it would be found east of the Isle of Wight, or further north. It has never even been recorded from the north coast of Cornwall, but it is possible that it could survive on the south coast of Pembrokeshire if it managed to get there. Other species with similarly restricted distributions in Britain are Segestria bavarica C. L. Koch, Clubiona genevensis L. Koch and probably Episinus maculipes Cavanna. Both sexes of E. herbigrada are adult from April to early June, and females may survive until September. A single female of E. herbigrada was recorded from Freshfield, Lancashire by Mackie (1962) and was included on the distribution map in Locket et al. (1974), but it is now thought that this was probably a misidentification. The specimen was determined by G. H. Locket, and it apparently no longer exists, but the habitat (litter at the edge of a pinewood) and time of year (January), make it extremely unlikely that it could have been herbigrada, and despite much survey work having been carried out in the area since then, it has never been rediscovered. I am grateful to Rowley Snazell and John Murphy for the loan of specimens of E. herbigrada from Kynance Cove and Prawle Point (England), Ronce-les-Bains, Charente Maritime (France), Sta Eulalia (Ibiza), Ghisonaccia (Corsica) and Cyprus. Heimer, S. & Nentwig, W. (1991) Spinnen Mitteleuropas. Parey, Berlin. Locket, G. H. & Millidge, A. F (1951) British Spiders, I. Ray Society, London. Locket, G. H., Millidge, A. E & Merrett, R (1974) British Spiders, III. Ray Society, London. Mackie, D. W. (1962) Report on spiders up to 1960. Rep. Lanes. Chesh. Fauna Comm. 32: 60-63. Roberts, M. J. (1985) The Spiders of Great Britain and Ireland, 1. Atypidae to Theridiosomatidae. Harley Books, Colchester. Simon, E. (1937) Les Arachnides de France, 6(5). Roret, Paris.